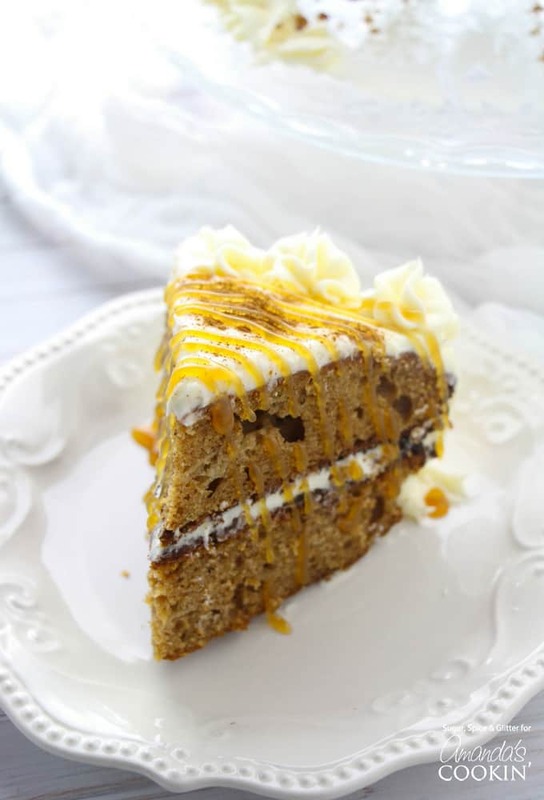 Last year, our Pumpkin Magic Cake recipe was the cake of the season, setting the bar high for this years follow up. Taking on a classic, we’re bringing you a moist Spice Cake done as a simple and elegant layer cake instead of a traditional sheet spice cake. 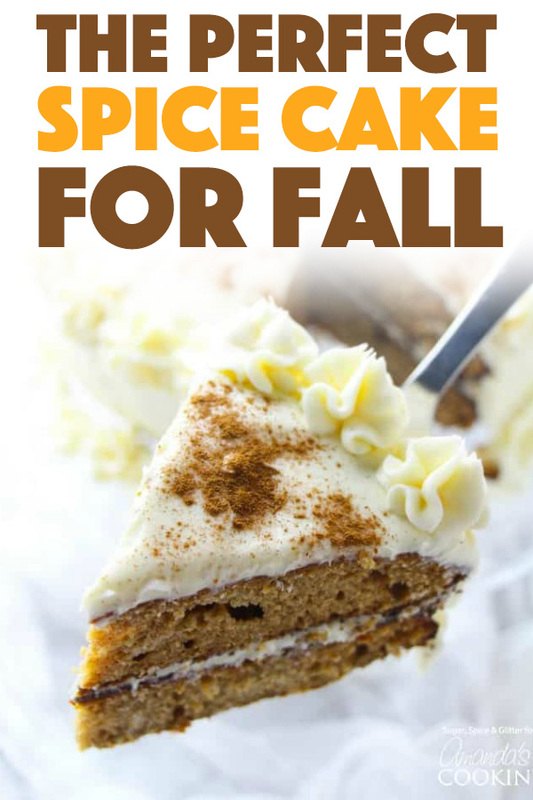 Spice Cakes are usually the simple, understated dessert at the fall table that makes a big statement once you take a bite – but this year, I decided to give our spice cake an upgrade with a slightly stiffer cream cheese frosting and a denser (but still moist and crumbly) cake that could stand up to stacking. 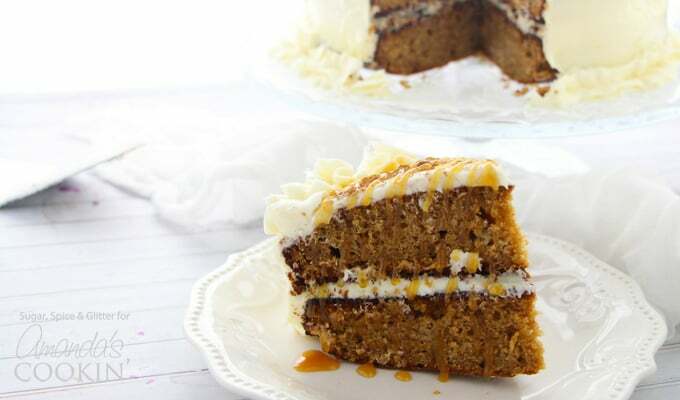 We still kept it simple with no crazy decorating techniques (just a simple star-dot of frosting around the edge that requires no skill) but I think there’s just something a bit more special about cutting into a layer cake… especially if you sprinkle it with a bit more spice and drizzle some caramel sundae sauce over top! 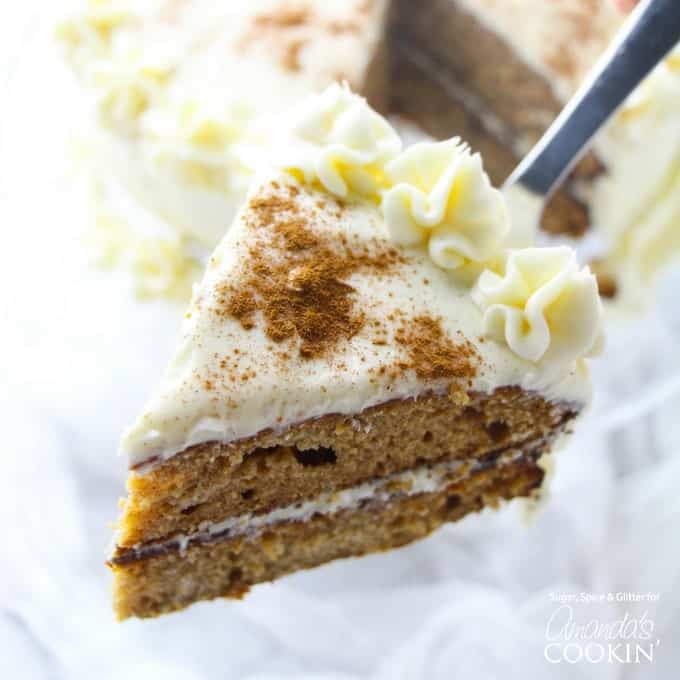 This spice cake has all of the classic flavors of fall – pumpkin spice, cinnamon, apple and even a hint of molasses, and is topped with a sweet-and-tart homemade cream cheese frosting that you’ll want to eat with a spoon. Spice cake has a reputation for being low maintenance and super easy – and this cake is no exception. You don’t even need to pull out a hand mixer to get that perfect fluffy texture – which is a bonus if you’re cooking with kids or just want minimal cleanup. I loaded mine with lots of spice and apple, but you can definitely tone down the spice and leave out the grated apple. The apple adds to the moisture of the cake and bakes in to be completely undetectable once cooked, but it doesn’t require a special trip to the store if you don’t have one on hand already. For more caramel-apple goodness, check out my Caramel Apple Crumb Cake recipe or my Caramel Apple Cupcake recipe. This spice cake is out of this world delicious and I hope you give it a try this season! What is your favorite fall dessert? Could it be this Pumpkin Bread with Maple Glaze this Baked Apple Crisp or maybe even these Pumpkin Spice Donuts! There are so many delicious fall dessert options out there! 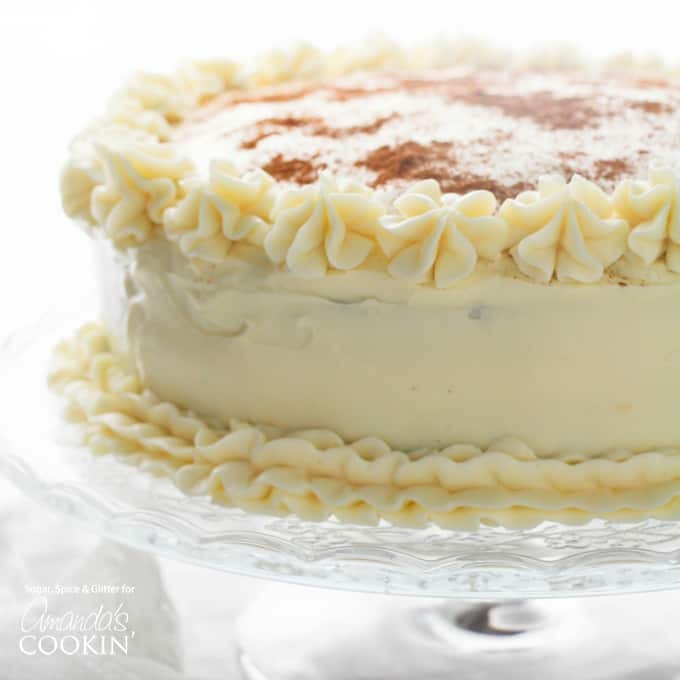 Taking on a classic, we’re bringing you a moist Spice Cake done as a simple and elegant layer cake instead of a traditional sheet spice cake. Grease and line two 8" or 9" cake pans with parchment paper and set aside. In a large bowl, whisk together the flour, baking soda, salt, pumpkin spice and cinnamon. Set aside. In a medium bowl, combine the oil, brown sugar, molasses, applesauce, eggs and vanilla. Make a well in the center of the dry ingredients and pour in the oil-sugar mixture. Whisk to combine until all ingredients are moistened and no dry patches remain. Grate your apple directly into the bowl and then stir to distribute evenly. Split the batter amongst the two pans - about 2 1/2 cups of batter per pan. Remove the cakes from the oven and let cool for one minute before turning out onto a cooling rack. While the cake is cooling, make the cream cheese frosting. Beat the butter and cream cheese together, then add 2 cups of powdered sugar and the vanilla extract. Adjust to taste and preferred consistency. When the cakes are cool, place one on your cake stand and place 1/2 cup of frosting ontop. Smooth to cover the whole top with your offset spatula, then sandwich the second layer overtop. Smooth all but 1/2 cup of frosting all over the cake. Sprinkle a bit of cinnamon over the top of the cake, if desired. Add 1/2 cup to 1 cup of powdered sugar to the remaining frosting to make it stiffer, then scoop into a piping bag fitted with a star tip. 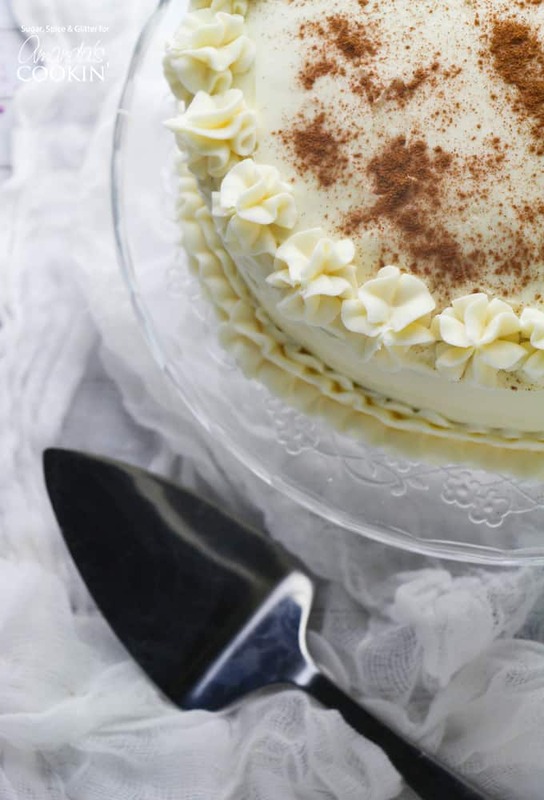 Make quick "dabs" of frosting along the edge of the cake by gently squeezing the piping bag and pulling it away firmly after about 1-2 seconds. Do this all around the top edge of the cake, and then just pipe a simple line of frosting along the bottom edge. Serve with a drizzle of caramel sundae sauce, as desired. Swoon. This is so gorgeous and looks SO delicious. Perfect for any special fall occasion! 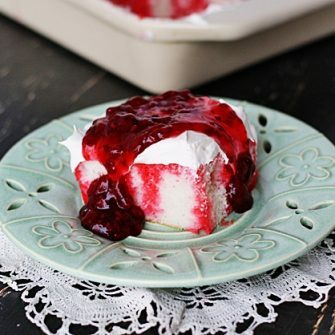 Amazing looking cake and recipe! Thanks for posting it. I’m not much of a layer cake kind of girl – think this probably could be baked in a 9×13 pan with adjustments for time? Thanks again – and happy baking! Hi Debbie! Yes you should be able to do that. The time should be approximately the same for a 13×9 as it is for two 9-inc rounds. However I recommend checking the cake about ten minutes before completion and then just keeping an eye on it after that.